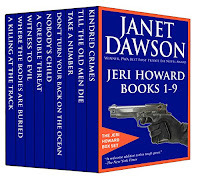 Janet Dawson announced the publication of an e-anthology featuring the first nine books in the Jeri Howard series. The ebook will be free on Amazon today Tuesday, May 29 and Wednesday, May 30! Head on over to this Amazon link on today and Wednesday, and get your copy! A seventeen-year-old Jeri tracked down when she swiped her mother's credit card and took off for Paris is now a "person of interest" in a murder case--and, once again, in the wind. 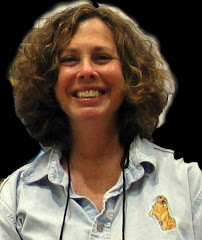 Jeri's newest client was about to blow the whistle on a large food manufacturer just before he took a header out his fifth-floor apartment window--but he hadn't yet told her what it was about. Next step: Undercover in the corporate office. Set in the fascinating and forbidden racetrack backside. 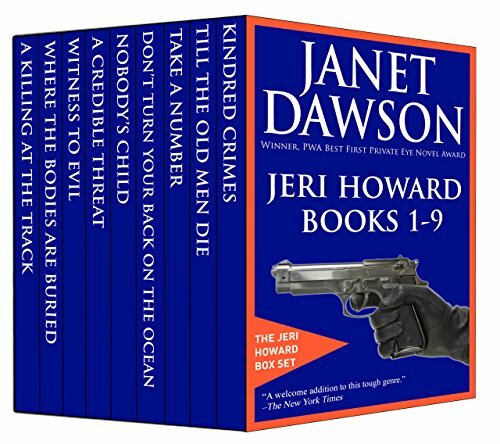 Dawson's complex plot is a pleasure--one dead jockey, then two dead jockeys, three exotic poisons, and several possible payoffs.